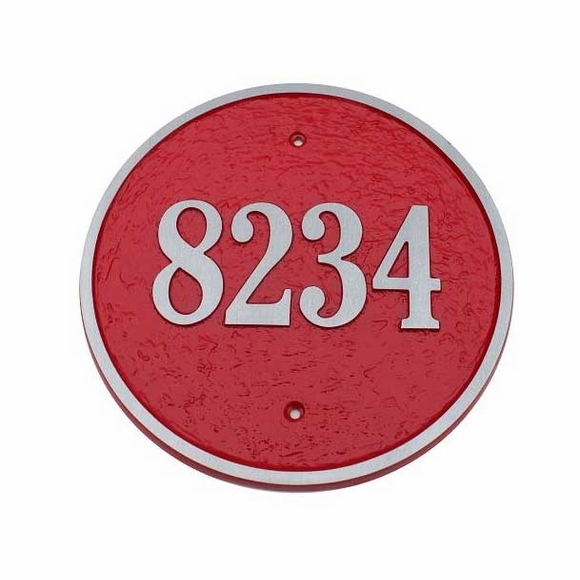 Round Cast Aluminum Address Plaque - - 10" circular house number plaque personalized with the address you specify. Surface mount on any exterior wall. Made in USA. Solid cast aluminum address sign comes in 16 colors including ruby red and deep purple. Aluminum numbers and border. Dimensions: 10" x 10"; weighs 3 pounds. Also available in solid cast brass (see top link in Related Products). 10" round house number sign personalized and hand crafted in the USA from start to finish to assure the highest quality.